Is it a vine, a tree or a bush? Since September Oaks introduced its new Kiwi Gold blend last month, several guests have asked if the kiwi is a vine, a tree or a bush. 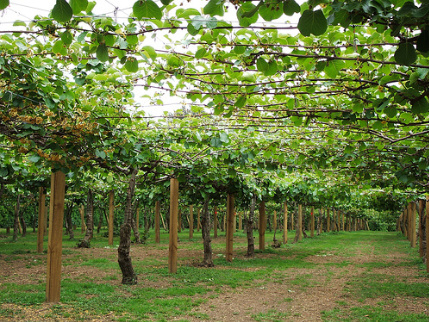 According to Raintree Nursery in Morton, Washington, kiwis are propagated from cuttings and grow into vigorous vines. Their lifespan is about 50 years, and the vines twist into thick trunks resembling trees. The vines cannot support their own weight and require strong support such as a trellis or arbor. 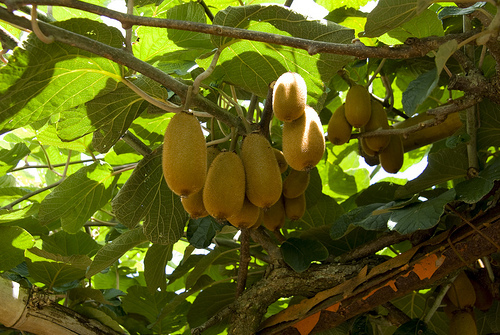 The plants will spread up to 30 feet, and a mature kiwi can produce 200 pounds of fruit. The 2000+ pounds of kiwi fruit used by September Oaks for its new kiwi/muscadine blend were harvested by hand at the Malphrus kiwi plantation in Ridgeland. Mr. Bobby Malphrus dropped by the SOV tasting room last week and told us that visitors may stop by the plantation on Rt. 462 to buy kiwis from the last harvest that have been kept in cold storage. Good to know: kiwi fruit are high in Vitamin C (2x that of an orange; 10x that of a lemon), as much potassium as bananas and a good amount of beta-carotene.